When Henry Brevoort completed his Greek Revival residence on Fifth Avenue north of Washington Square in 1834 he set the tone for the street for more than a century to come. His was the only mansion on Fifth Avenue; but it would soon be joined by others as Fifth Avenue quickly became synonymous with millionaires and mansions. Three years after the Brevoort house was completed Fifth Avenue was cut through to 23rd Street and beyond. There, in what would be the intersection of 23rd Street and Fifth Avenue sat the farmhouse of John Horn. The Common Council ignored the old structure until 1839 when it was moved to the northwest corner of 23rd Street and Broadway. Still substantially north of the city, the Horn farmhouse became a roadhouse known as the Madison Cottage named for James Madison who had died three years earlier. 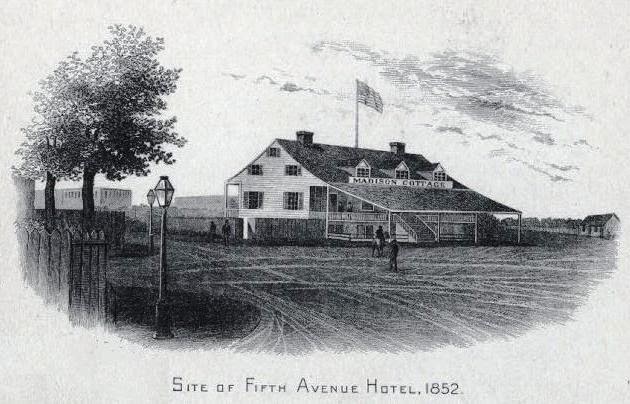 Run by Corporal Thompson, it was “a famous resort of the riders and drivers from the City, still some miles south, and was also a post tavern in the coaching days,” remembered The Fifth Avenue Bank’s booklet Fifth Avenue in 1915. But by the time of the epidemic, the days of the Madison Cottage were numbered. It was torn down and replaced by Franconi’s Hippodrome which opened on May 2, 1853. A two-story brick arena, it was covered in canvas and could hold 6,000 people. The oval ring in the center was 200 feet wide by 300 feet long. But within two years the ambitious venture failed and the property was purchased by Amos R. Eno. On August 23, 1859 his grand edifice was opened to the public. Eno had leased it to the well-known hotelier Paran Stevens. Victorian visitors would be struck by the grandeur. There were 15,000 “superficial feet” of marble used on the interior. The entrance hall floor was laid in a diamond pattern of white and dark red marble and the counter was solid white marble. On the first floor were the various shops and offices for the convenience of travelers: a Reading Room, Telegraph Office, a “literary depot for books, newspapers, etc.,” the barber shop, wash room, and a restaurant. Aside from the main entrance, the portico of which was supported by cast iron columns painted to resemble marble, there were four other entrances. One, of course, was devoted to ladies and led directly to the ladies’ reception room on the floor above. “This room is exclusively for ladies, to which is attached bath, toilet room, closets, etc.,” noted The Times. 23rd Street is in the process of being paved in this early stereoscope view of the white marble hotel. The second floor corridor was lined with double rows of Corinthian columns. 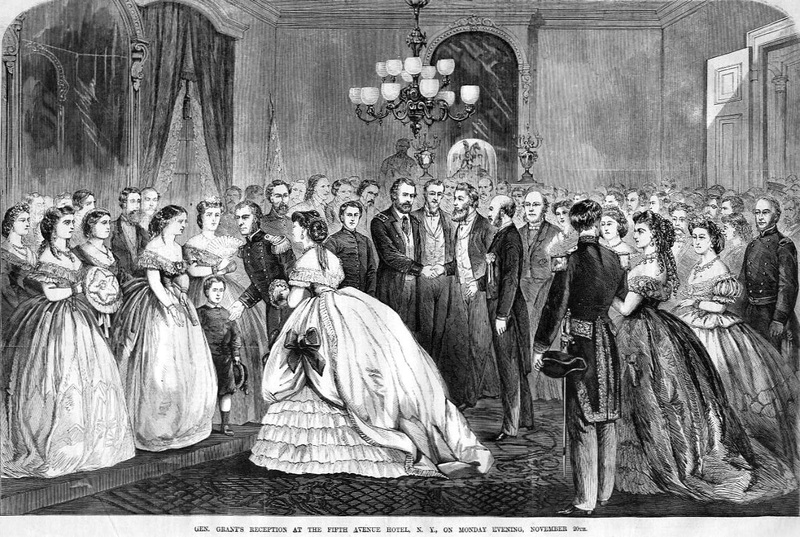 “It is handsomely carpeted and painted, and lighted with sidelights, the same as the hall below, and will be used as a kind of rendezvous for the ladies in the evening,” said The New York Times. Eleven chandeliers lighted the hallway, the ceiling of which was “handsomely decorated.” On this floor were the main dining room and another, “for early dinners and breakfast,” and the ladies’ tea room. Eno and Stevens had spent lavishly on furnishings and planned the hotel with top-notch accommodations. “There are 8 public and 120 private parlors, 4 dining and tea rooms, 450 chambers, and 90 other rooms for servants. The suites of apartments are arranged to suit the size and requirements of families or single persons. These rooms are all furnished with wardrobes, bureaus, lounges, easy chair and table,” reported the newspaper. Miller’s Stranger’s Guide for the City of New York described the suites as “each combining the conveniences and luxury of parlor, chamber, dressing, and bathing rooms.” But the innovation that grew the most comment was the elevator—reportedly the nation’s first. 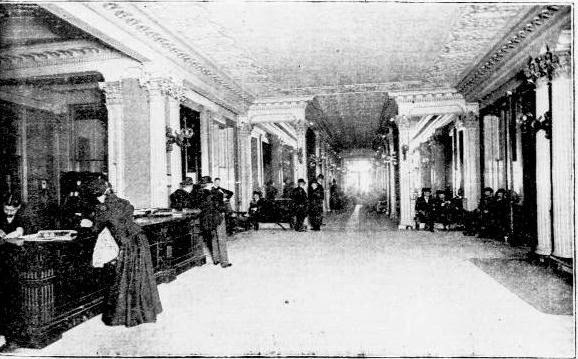 “A new system has been devised and applied in the Fifth-avenue Hotel in this City,” reported The Times, "by Mr. Otis Tufts, a well-known engineer of Boston. With it the appliances of safety are not only practicable but convenient. The car, or little parlor, in this case, is elevated by a vertical screw, extending from cellar to attic, and revolved by a belt from a steam-engine.” The contraption operated on the principal of a nut on a bolt—the nut being the passenger car. Stevens was tasked with making rather non-majestic rooms special. The Times said “The furniture of the rooms devoted to the use of High Royal Highness is by no means gorgeous. The upholstery is plain, not gaudy; rich, not ostentatious. 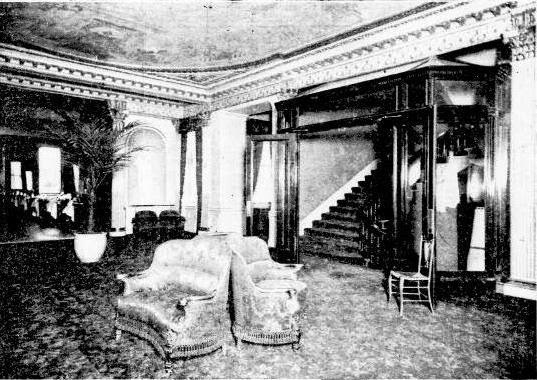 The wood work of the chairs, lounges and sofas is of brilliantly polished rosewood, carved in the utmost simplicity, but with exquisite taste.” To upgrade the rooms, Stevens went to the city’s foremost dealers in art. On loan to the Hotel for the Prince’s visit were dozens of costly oil paintings and water colors. Included was Church’s “Great Fall of Niagara,” a portrait of Washington by Rembrandt Peale, a religious painting by Rubens and a miniature of the Queen Victoria painted at Buckingham Palace in 1841. As a matter of fact, in the Prince’s bedroom Stevens almost exclusively hung portraits of the Royal Family—perhaps as a gesture to prevent homesickness. In 1864 a Confederate terrorist plot involved the simultaneous setting of fires in the major hotels throughout the city. The theory was that with major fires burning at the same time, firefighters would be overwhelmed and the city would burn. At around 8:45 on the evening of November 25 fire was discovered in the St. James Hotel. Within minutes fire alarms were sounded from the St. Nicholas Hotel, the Lafarge House, the United States Hotel, the Metropolitan, Lovejoy’s and the New England Hotels. Terrible Calamity at the Fifth-Avenue Hotel. Twenty-Two Women Smothered and Burned by Last Night’s Fire. Just before midnight fire broke out on the top floor. When fire fighters brought their hose into the hotel, panic broke out among the guests who clogged the hallways and lobby with their valises and trunks as they sought escape. Despite their understandable concerns, the guests were safe. It was the servants’ floor that was ablaze and the fire did not travel downward. The land had been auctioned a year earlier in settlement of the estate of Amos R. Eno and was purchased for $4.25 million. The intended structure was anticipated to cost $5 million; not including the expense of demolishing the structures. As was most often the case when landmarks were slated for destruction, newspapers wistfully reminisced about the old hotel; but no one considered preservation. “There are many places of historic interest in this City of New York,” lamented The Times on July 7, 1907, “but few if any, that are more famous than the renowned hostelry, the Fifth Avenue Hotel, which, according to recent well-authenticated reports, is soon to make place for a new skyscraper. Three months later the demolition process was well underway. The exquisite marble and “choice decorations,” as described by the Record & Guide were carefully removed and taken to the Rheinfrank House Wrecking Company at No. 620 East 14th Street in a surprisingly early example of architectural salvaging. On the site rose a modern office building designed by Robert Maynicke and Julius Franke, known today as the Toy Center Building, and completed in 1909. In 1841 a 16-year old boy arrived in New York City from Ireland with no money and no acquaintances. He had sneaked aboard the ship Ironsides bringing with him little more than vast ambition and ironclad determination. John H. McCunn had no intentions of surviving on the street as a newspaper boy or bootblack—he would be a lawyer. The young, driven Irishman’s practice was successful; enough so that by 1855 he was investing his money in real estate in the rapidly developing Chelsea neighborhood. That year he built a handsome Anglo-Italianate house at No. 411 West 22nd Street. At only 16.8 feet wide, the house was in some ways less impressive that other, grander homes on the block. But with its the up-to-date style and fashionable architectural appointments, No. 411 held its own. The house sat back from the property line, its small yard protected by an attractive cast iron fence. A rusticated brownstone base with two arched openings upheld the four floors of red brick. The windows of each floor were treated differently, yet all were framed in carved brownstone that contrasted pleasantly with the rich red brick. A robust bracketed cornice completed the design. McCunn held on to the completed property, renting it to merchant-class families. In 1866 the family of George Francis Merchant lived here. That summer, on August 21 at 5:00, the funeral of George Augustus Brown was held in the parlor. The 54-year old had died of sun stroke while in New Orleans two weeks earlier. Whether the Brown family had replaced the Merchants as residents; or whether the funeral was held here as a gesture of friendship is unclear. By now the good luck of John H. McCunn was running out. In 1860 he has been elected City Judge under the Tammany Hall administration. He left New York to fight in the Civil War and was honored for his bravery at the Battle of Malvern Hills. But he was later ordered court-martialed for his treatment of a subordinate. 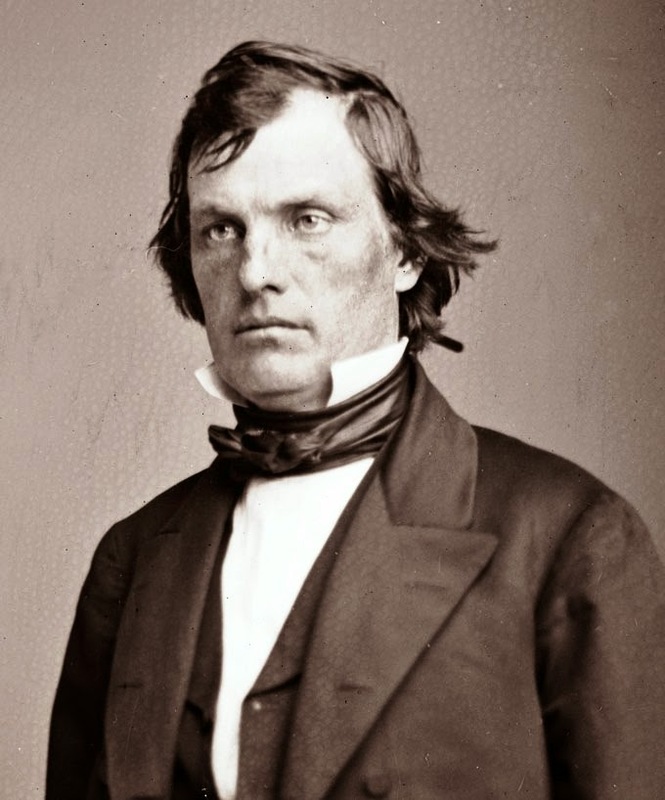 He avoided trial by resigning; however General McClellan issued an order that John McCunn could never again be admitted into the United States Army. Fine took the opportunity of the senior member’s death to garner a fortune. McCunn had drawn his own will and Christopher Fine offered to represent the heirs in contesting it. “It is a singular fact that the death of the senior member of the firm with which Mr. Fine began his legal studies afford the opportunity for his most famous victory in the courts,” The Times later recalled. Among the properties contested was No. 411 West 22nd Street where, at the time E. L. Lawrence was living. After a ten-year battle Christopher Fine won the case when the courts eventually declared the will invalid. His fee for breaking the will was $200,000—nearly $4.5 million today. He also walked away with the title to No. 411 West 22nd Street. The house became home to Charles Van Tine and his family. Van Tine was the son of the wealthy and influential Theodorus Van Tine. Theodorus, who died in February 1862, had been a member of the New York County Committee on Annual taxes, Chairman of the Board of County Canvassers of the City and County of New-York, and a Director in the Phoenix Bank. The extended Van Tine family were long-time Chelsea residents; growing up in the Theodorus Van Tine home at No. 111 West 38th Street. Now, on the same block with Charles, sisters Emma and Anna lived at No. 433 West 21st. Charles died unexpectedly on October 4, 1886. Two days later at 3:00 his funeral was held in the parlor of No. 411. The family remained in the house and by 1888 daughter Elizabeth was teaching music at Grammar School No. 32 on West 35th Street. The sale apparently fell through and on January 11, 1895 The New York Times reported that Fine sold the house to David Bonner. Somewhat astonishingly, Bonner's wife, who had died a year earlier, was Catherine McCunn, the daughter of Judge McCunn's half-brother, Mark. It had been Catherine and her sister, Elizabeth, who had retained Christopher Fine to break their uncle's will. If Bonner lived in the house at all, by the turn of the century it appears it was being operated as a boarding house. The building was sold in 1915 and once again became a private home. John A. Sheeran, a real estate broker, had run as Republic candidate for assemblyman in 1900 and had been Adjutant in the 69th Regiment Camp No. 93. By the 1930s it was home to Mary Isabel Malmar and her son Girard. Mary’s husband, John Jay Malmar who had been an executive with the Corn Exchange Bank had died in 1911. She died in the in house at the age of 73 on October 4, 1938. Girard would not remain in the house long, and in 1940 it was converted to apartments—two per floor. Today little has changed. With still just two apartments per floor, it endures a grisly but necessary fire escape. The paned windows have been replaced and some sort of ornamentation at the second story windows—perhaps small cast iron balconies—is missing. But essentially the house survives intact, including the beautiful Italianate cast iron fencing. “The year 1903 will certainly go on record as the banner year for building theatres in New-York City,” wrote the New-York Tribune Illustrated Supplement. Indeed, at the turn of the last century there was no longer any question that the theater and entertainment district had abandoned 23rd Street and was rapidly entrenching itself around Times Square. On July 12, 1903, at the time of the Tribune’s assessment, there were six new theaters already under construction and three more planned to begin before the end of the year. Among the flurry of rising theaters was the Lyric, being built by real estate developer Eugene C. Potter. Just a few months earlier Potter had found himself scurrying to lease the house. It was conceived as the venue for Reginald DeKoven’s American School of Opera. But midway into construction the opera school failed. 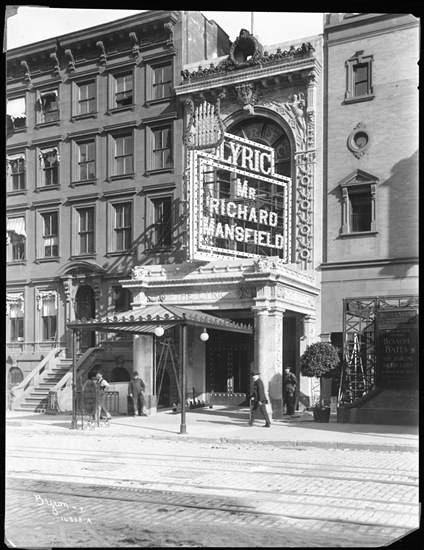 The Shubert Brothers came to the rescue; and to counter the competition of so many new theaters, the brothers pulled an ace from their sleeve—Richard Mansfield. The handsome and talented Mansfield was a matinee idol and a guaranteed box office draw. Born in Germany, he started his successful stage career in London. 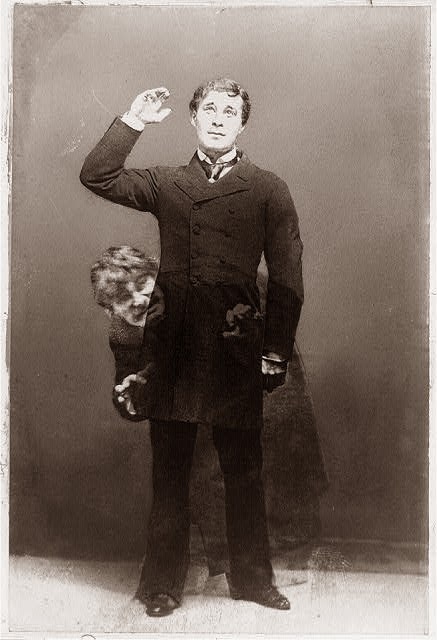 There suffered through a public relations disaster in 1888 when, while he was playing the title role in the Strange Case of Dr. Jekyll and Mr. Hyde, he was accused of being Jack the Ripper. By now, however, the ugly incident was behind him and he was one of the most popular actors in New York. Having secured Mansfield, plans could go forward. Koehler studied theater plans and instituted ground-breaking changes to facilitate the flow of patrons, and easy egress in case of fire. The entrance was on 42nd Street in the comparatively narrow frontage—the width of a brownstone home—embellished with limestone carvings and neo-classical motifs. Two bas relief angels lounged in the spandrels of the two-story arched opening, one holding the mask of Tragedy, the other Comedy. Patrons entered “simply a lobby leading into the side of the auditorium proper,” said the Tribune. The relatively small lobby area exploded into the large auditorium which stretched through to 43rd Street. Following the production, theater-goers would exit through the more expansive 43rd Street side—thus enabling a much faster emptying of the theater. Interestingly, the architectural treatment of this facade bore little resemblance to the 42nd Street entrance. 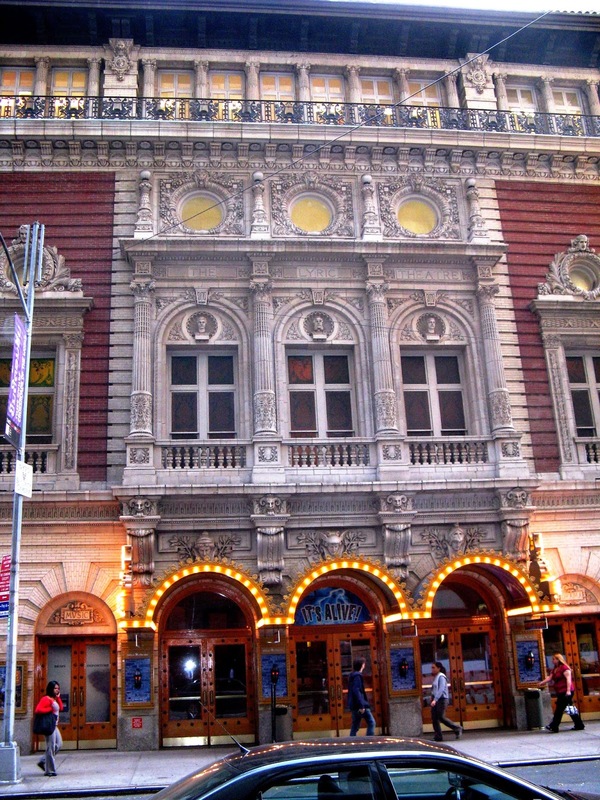 Neo-classical wreaths, here executed in terra cotta, mimicked the copper wreath surmounting the 42nd street cornice; but the red and white brick, limestone and terra cotta 43rd façade shared little else. Reflective of the theater’s name, the ornamental iron railing at the top floor was composed of lyres. In the arches above the three central windows over the entrance were busts of William Schwenck Gilbert and Arthur Sullivan (the famous Gilbert & Sullivan team); and (too late to change) Reginald DeKoven. The immense proscenium arch had been cast as a single piece of solid steel by the Milligan Brothers firm in Brooklyn. Once it was constructed the task of getting it into Manhattan and the construction site was tackled. On March 27, 1903 the Brooklyn Bridge was shut down as “the enormous solid steel proscenium arch of the theatre” was carefully and slowly transported across the East River. Mansfield was the main draw for the Lyric; but the Shuberts managed to book other top-named talent. In 1904 Otis Skinner played Petruchio in The Taming of the Shrew. “Mr. Skinner was interrupted over and over again by applause that could not wait apparently until he had finished his lines,” reported The Times on January 19, 1904. A week earlier Douglas Fairbanks Sr. and Wilton Lackaye had opened in The Pit. The Shuberts continued to intersperse Mansfield’s appearances with money-makers. Minnie Maddern Fiske, most often simply billed as “Mrs. Fiske,” was widely considered the most important actress of the American theater. She took the stage here in 1906. Tyrone Power, Sr. and William Faversham played in Julius Caesar six years later. As the United States was pulled into World War I, patriotism flourished at a time when changes in entertainment were taking place. 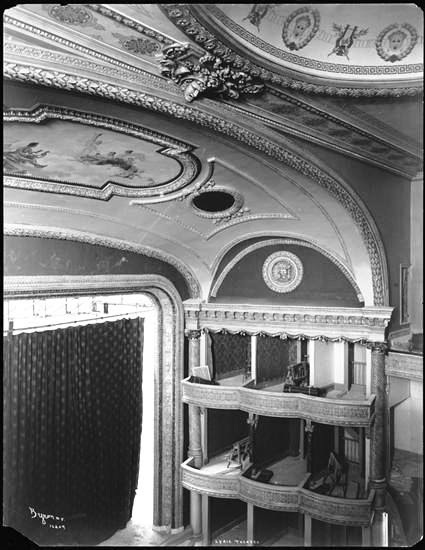 In 1918 the Lyric complement live theater with motion pictures. 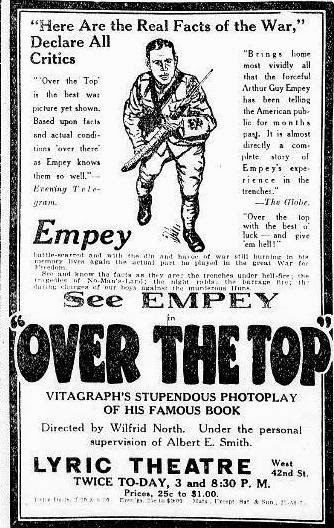 On April 14 the New-York Tribune noted “’Over the Top,’ with Sergeant Arthur Guy Empey, begins its third week at the Lyric Theatre to-day, and announcement is made by Albert E. Smith, president of the Vitagraph Company, that the big screen story will continue indefinitely.” Audiences not only saw the nationalistic motion picture, they heard live addresses by journalists and military men. The films offered here were not just about the war. On June 30 that same year the “photodrama” What Are You Going to Do With Us? premiered. “It is described as filmdom’s first fact photoplay of the countless tragedies of the world’s women of the Third Estate, the story basing it being literally a transcript from the life incident to the crusade for a cleaner city of San Francisco,” explained the New-York Tribune. After the war the Lyric alternated live shows with motion pictures. Throughout the 1920s audiences would see Fred and Adele Astaire, The Cocoanuts with a score by Irving Berlin, the Marx Brothers and Margaret Dumont, and in 1928 the musical version of The Three Musketeers produced by showman Florenz Ziegfeld. The Great Depression would signal the end of the Lyric’s successes. The last was Cole Porter’s Fifty Million Frenchmen which featured hit songs like “You Do Something to Me.” The Lyric’s last attempt at legitimate theater was Run, Little Chillun! which opened on March 1, 1933. The grand theater, through financial necessity, became a motion picture house. The interiors remained essentially unchanged throughout the decades until wide-screen movies prompted the owners to remove nine of the original boxes. Although the Brandt Brothers—William, Harry, Louis and Bernard—hoped to reestablish the Lyric as a legitimate theater in 1979; it was not to be. 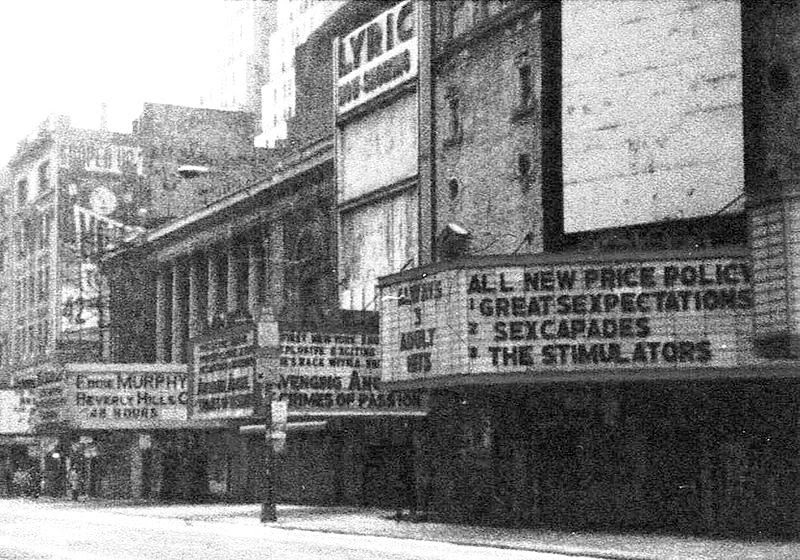 They refurbished the facades but the unsafe, unclean condition of 42nd Street in the 1970s, along with the general financial troubles of Broadway in general, prevented their plan. Inside, the beautiful Lyric Theater had little changed since its doors opened in 1903. But the 42nd Street Redevelopment organization condemned the structure. Shuttered, the theater’s heat was shut off, and deterioration set in. 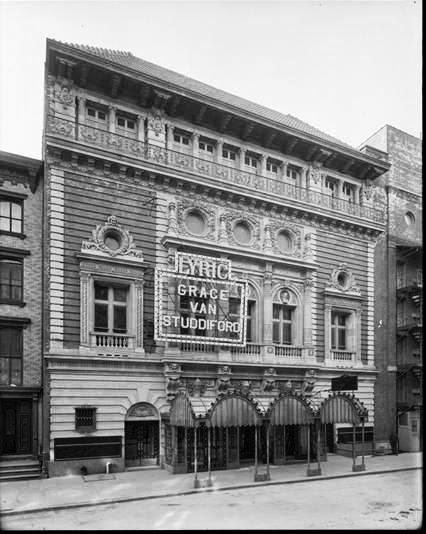 Despite the historic preservation movement that, by now, was taking firm hold in New York City; in 1996 Canadian Garth Drabinsky negotiated with the 42nd Street Redevelopment group, who gave him permission to destroy the old Lyric Theater. The two facades were preserved and the Ford Center for the Performing Arts was erected between them. Today V. Hugo Koehler’s two exteriors survive. Behind the walls, however, the glorious interiors of green and rose are gone; replaced by clean lines of little interest.